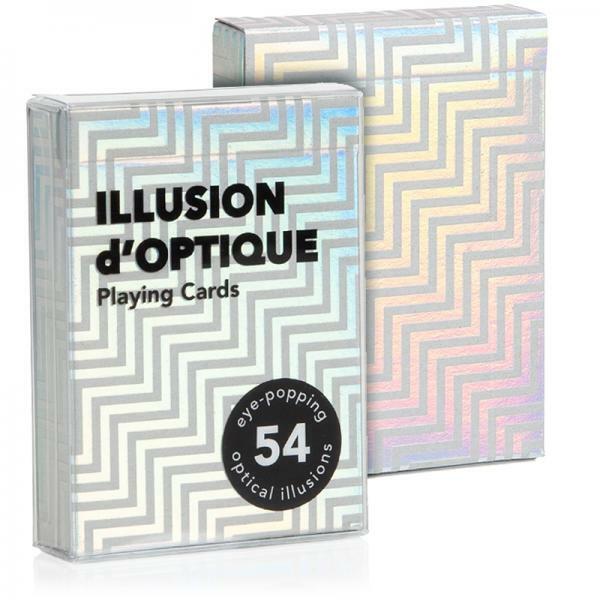 "Illusion d’Optique is the most jaw-dropping collection of optical illusion playing cards ever assembled. Housed in a wild, rainbow-sheen holographic tuck-case, you may feel like you're hallucinating before you even open up the box. Inside, you’ll find 54 eye-popping original designs created by a master of visual perception, Gianni Sarcone. Watch closely as colors change, shapes transform and static, printed ink seems to come alive. Sarcone has included updated versions of classic illusions, plus innovative new concepts he developed after years of study. Illusion d’Optique is not only a beautiful deck, but it also serves as fascinating proof that seeing is not necessarily believing. Printed by The United States Playing Card Company on our trademark thin-stock preferred by magicians and cardists."